Week 3: Workout C – My Journey to Godliness! I did not get enough sleep today, maybe about 4 hours worth. Think I was kinda excited to lift today that and my puppy waking me up! Weights still feel not too heavy and I think my body is getting used to the routine again. Took some extra White Flood today to boost me up and I think it helped! Also found out there is another 12 week Transformation Contest coming next week so I think I will enter it and hopefully I do not get sick near the end of my 12 weeks like last contest! Actually excited about it because I like to challenge myself and see what I can do in 12 weeks. Squats still somehow felt a little light still even though I increased the weight by +10 lbs from last session! I also realized that I was putting the bar a little too high and made it more low bar and it feels nice! Learned something new everyday lol! For a year i thought I was squatting low bar and somehow I just had an “AHA!” moment and found that spot on my back that shelved the bar real nice now! Think I will have to lower the rack pins a notch down as I had to lean up a bit just to rerack now! Reracking today after I found that nice shelf on my back for the bar is when I realized my bar positioning has been off for until today! The ONLY thing that almost got me real upset was when some idiot accidentally rolled a ball underneath me on my last rep of 5×5 as can be seen on the video above! Added another +10 lbs from last session and the bar still felt a bit light. Didn’t really had a feeling of struggling until the very last rep on my 5th set! Enjoyed the lift and I almost got upset when the person spotting me on the last set decided he wants to hold the bar when I was struggling on my 5th set last rep! I specifically told each and EVERY Spotter before they spot me NOT to touch the bar unless its about to smash my face! I don’t need anyone do shoulder shrugs when I am benching! Added +10 lbs also and the bar still felt light also. BUT my form is not good. Found out I am rounding my lower back so need to focus on fixing that the next few sessions! Added +10 lbs also and it all went well. Energy level was still up at this stage! Did feel the burn on the last set! I hope to get better results this time around. 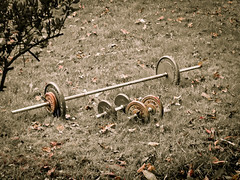 So now that you pushing around some heavier weights how long is your rest between sets? Is rest between sets getting longer each workout? When I do Squats I get a breather for 1 minute then get under the bar. I may take another minute under the bar to get ready then I start. On Week 6 now and once I get to my later sets I can ramp my rest time no more than 5 minutes max! For OHP, BOR and BP I get a breather for about 30-45 seconds then get back to the bar and setup no longer than a minute. When I get my breather I just pace around the gym to stretch myself out and get some air while sipping on my Intra-workout drink. I tend to finish or almost finish my 1.7 liter bottle of my liquid replenishment while working out! Sometimes I wear my Heart Rate monitor to make sure I keep myself at a constant heart rate level.